Is United Continental Holdings Inc (NASDAQ:UAL) a buy here? Prominent investors are getting more optimistic. The number of long hedge fund positions improved by 6 lately. 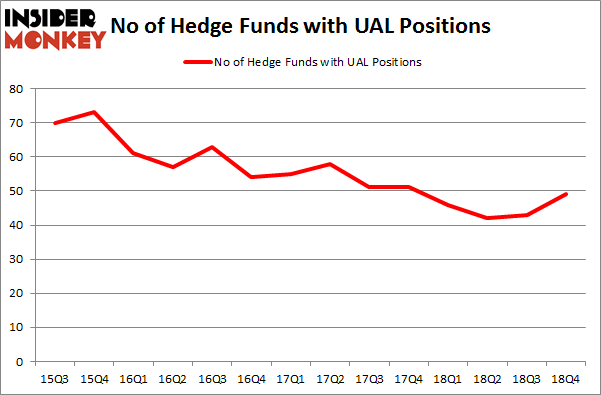 Our calculations also showed that UAL isn’t among the 30 most popular stocks among hedge funds. Let’s check out the recent hedge fund action surrounding United Continental Holdings Inc (NASDAQ:UAL). What does the smart money think about United Continental Holdings Inc (NASDAQ:UAL)? Heading into the first quarter of 2019, a total of 49 of the hedge funds tracked by Insider Monkey were long this stock, a change of 14% from the second quarter of 2018. On the other hand, there were a total of 46 hedge funds with a bullish position in UAL a year ago. So, let’s review which hedge funds were among the top holders of the stock and which hedge funds were making big moves. When looking at the institutional investors followed by Insider Monkey, Warren Buffett’s Berkshire Hathaway has the most valuable position in United Continental Holdings Inc (NASDAQ:UAL), worth close to $1.8369 billion, amounting to 1% of its total 13F portfolio. On Berkshire Hathaway’s heels is Paul Reeder and Edward Shapiro of PAR Capital Management, with a $1.3082 billion position; 21.9% of its 13F portfolio is allocated to the stock. Other peers with similar optimism include Brad Gerstner’s Altimeter Capital Management, Alex Snow’s Lansdowne Partners and Ric Dillon’s Diamond Hill Capital. Consequently, some big names have been driving this bullishness. Ashler Capital, managed by Matt Simon (Citadel), established the largest position in United Continental Holdings Inc (NASDAQ:UAL). Ashler Capital had $45.9 million invested in the company at the end of the quarter. Brandon Haley’s Holocene Advisors also initiated a $22.7 million position during the quarter. The following funds were also among the new UAL investors: Mark Kingdon’s Kingdon Capital, Andrew Feldstein and Stephen Siderow’s Blue Mountain Capital, and Paul Marshall and Ian Wace’s Marshall Wace LLP. Let’s now take a look at hedge fund activity in other stocks – not necessarily in the same industry as United Continental Holdings Inc (NASDAQ:UAL) but similarly valued. We will take a look at SunTrust Banks, Inc. (NYSE:STI), Brown-Forman Corporation (NYSE:BF-B), Interactive Brokers Group, Inc. (IEX :IBKR), and Fortive Corporation (NYSE:FTV). This group of stocks’ market caps match UAL’s market cap. As you can see these stocks had an average of 26.5 hedge funds with bullish positions and the average amount invested in these stocks was $639 million. That figure was $6716 million in UAL’s case. SunTrust Banks, Inc. (NYSE:STI) is the most popular stock in this table. On the other hand Brown-Forman Corporation (NYSE:BF-B) is the least popular one with only 21 bullish hedge fund positions. Compared to these stocks United Continental Holdings Inc (NASDAQ:UAL) is more popular among hedge funds. Considering that hedge funds are fond of this stock in relation to its market cap peers, it may be a good idea to analyze it in detail and potentially include it in your portfolio. Our calculations showed that top 15 most popular stocks among hedge funds returned 19.7% through March 15th and outperformed the S&P 500 ETF (SPY) by 6.6 percentage points. Unfortunately UAL wasn’t in this group. Hedge funds that bet on UAL were disappointed as the stock lost 2.4% and underperformed the market. If you are interested in investing in large cap stocks, you should check out the top 15 hedge fund stocks as 13 of these outperformed the market. Were Hedge Funds Right About Souring On Canon Inc. (NYSE:CAJ)? Here is What Hedge Funds Think About AutoZone Inc. (AZO) Hedge Funds Dropped The Ball On Fortive Corporation (FTV) Were Hedge Funds Right About Flocking Into Sempra Energy (SRE)? Here is What Hedge Funds Think About BT Group plc (BT) Is IQVIA Holdings, Inc. (IQV) A Good Stock To Buy?